Your team members showed excellent customer service skills every time we spoke. The location was excellent. We wanted to be near attractions, but we also wanted privacy. This cabin offered both. The directions were great. Found the place easily. Very convenient to be able to go directly to the cabin. Penny was very sweet when she called to see if we made it okay. We loved it. The pictures on the website do not do it justice. We enjoyed the hot tub and game room. Great family getaway. Hope to come back again. My wife and I celebrated our anniversary at Native Winds. We loved the location and cabin. No complaints at all. Everything was as it was said to be, and worked like it was said to work. This was our second stay at Sunrise above the Clouds and it was wonderful - again! The kitchen has everything needed to prepare meals, but if eating out sounds better downtown is only a short drive. We especially love the downstairs area - nice quite get away if a midday nap is needed. Only thing I would change about downstairs - a mini frig and coffee maker. This would prevent early risers from waking the late sleepers. We love the soaking in the hot tub and looking out over the clouds at the mountains. Thanks for letting your home be our home! 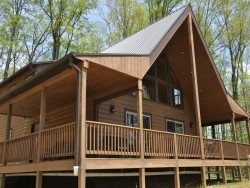 The cabin was everything and more, a true luxury in the woods! Well supplied with cooking essentials, comfortable furniture, beautiful view! Internet access good, limited cell phone access though. Mother nature brought us a bear to watch one night so be sure to secure your garbage outside..they are pretty smart animals! A welcome surprise for us. The only inconvenience is that the entry gate was on the fritz and needed to be repaired during our stay and I was given the wrong lockbox code to the cabin and with limited cell service and daylight buring was a bit troubling but forgot all about it once in the cabin! We are adventure seekers so mountain biking, hiking, ziplinng and whitewater rafting are all close by! Many pamphlets in the cabin if you did not plan ahead, we got there the final week before season closing so plan accordingly. It also was important to us to come home to a hot tub and a comfortable place to relax after an action packed day. We also took a day to enjoy and shop in near by towns. Bottomline, I would stay here again. Do listen and follow instructions provided, arriving the first day during daylight hours was extremely helpful advice even if all went as planned! I have rented this house twice. Once with my children in the summer and again with two other couples in October. Both times were perfect. The kitchen is beautiful and has everything that we needed. The house is located in a gated community with beautiful homes throughout. This was a surprise to me and gave me comfort in safety. The house is an easy drive to Bryson City and Cherokee. The only negative that I could possibly say is the driveway to the house is very steep and I would not want to attempt the drive in the snow. I will definitely rent this house again ... Soon. Great location and a beautiful cabin. Everything was as described with no surprises. We plan to rent the same cabin again in august of 2014. Driveway was extreme! We had a real good time. The next time we will stay longer. My wife and kids liked that each child got their own bedroom. We loved the furniture and we will be back. This cabin was everything and more, a true luxury in the woods! Well supplied with cooking essentials, comfortable furniture, beautiful view! Internet access good, limited cell access though. Mother nature brought us a bear to watch one night so be sure to secure the garbage outside...they are pretty smart animals! A welcome surprise for us. We are adventure seekers so mountain biking, hiking, zip lining and white water rafting are all close by Many pamphlets in the cabin if you did not plan ahead. We got there the final week before season closing so plan accordingly. It also was important to us to come home to a hot tub and a comfortable place to relax after an action packed day. We also took a day to enjoy and shop in near by towns. Bottom line, I would stay here again. Do listen and follow instructions provided, arriving the first day during daylight hours was extremely helpful advise even if all went as planned! What a cabin! Amazing in every way,easy to get to,amazing views comfortable, clean and very relaxing! Great Smoky Cabin Rentals, you have a winner in this cabin,pet friendly,King (comfy) Bed, Leather Furniture, Easy to get in and out of, close to our beloved Bryson City. Love it! was NOT prepared for the goat paths leading up to the cabin !! (wish we had been forewarned) And did not have the presence of mind to alter cooking recipes on the high altitude.will know next time !! Manager Response - 12/11/13: Thank you for your feedback, Anne. We appreciate your time in reviewing Smoke Rise Cabin. We're glad you enjoyed your stay. While the roads up to the cabin are probably steeper and more windy than you are used to in MS, the roads are easily accessible with a regular car. The roads are paved and much better than other roads in this area. On all of our directions regardless of their elevation we include the following advice: IMPORTANT NOTE: If you are not used to driving mountain roads, you will find this to be a new experience. Be sure to put your car in a lower gear going up and down the mountain and do not stop while climbing. As far as cooking in the mountains goes, the altitude may add a few minutes to the cooking time. Even without the elevation, cooking with a different range and oven and using different cookware can impact cook times as well. Please keep us in mind for your future vacations -- you can use the code from the survey to book online and receive the repeat guest discount off any of our cabins, or call to receive the discount. Happy Holidays!